These rugged Gear Ties have an integrated stretch-loop on one end, allowing them to fit over cord, cable, and hose ends of most sizes so they can remain attached keeping them conveniently available to wrap the cord whenever needed. Waterproof, reusable, bendable, and impressively strong, these Cordables feature all the same benefits of the Original Gear Tie, plus that integrated stretch loop so they stay put on your cord. Everyone is familiar with the standard garage peg racks that work fine when it comes to hanging tools with D-shaped handles or built-in holes, but that means everything thing else you want to organize - all that odd-sized gear, tools, and equipment - ends up stacked in a corner or leaned against a wall, cluttering your garage or workspace. Gear Tie Dock able Twist Ties solve this problem. Their tough plastic mountable Dock permanently screws into the wall and has a grooved V-shaped opening that securely grips its flexible, durable Gear Tie at any point you attach it. The Gear Tie itself features a grippy rubber surface for extra hold both around your gear and in the Docking Anchor. Just wrap the Gear Tie end around even the most unchangeable items (it's fitted with an integrated loop at one end, which makes hanging and cinching a breeze) and slide the Gear Tie into the Dock. Gear Tie 6 Inch. 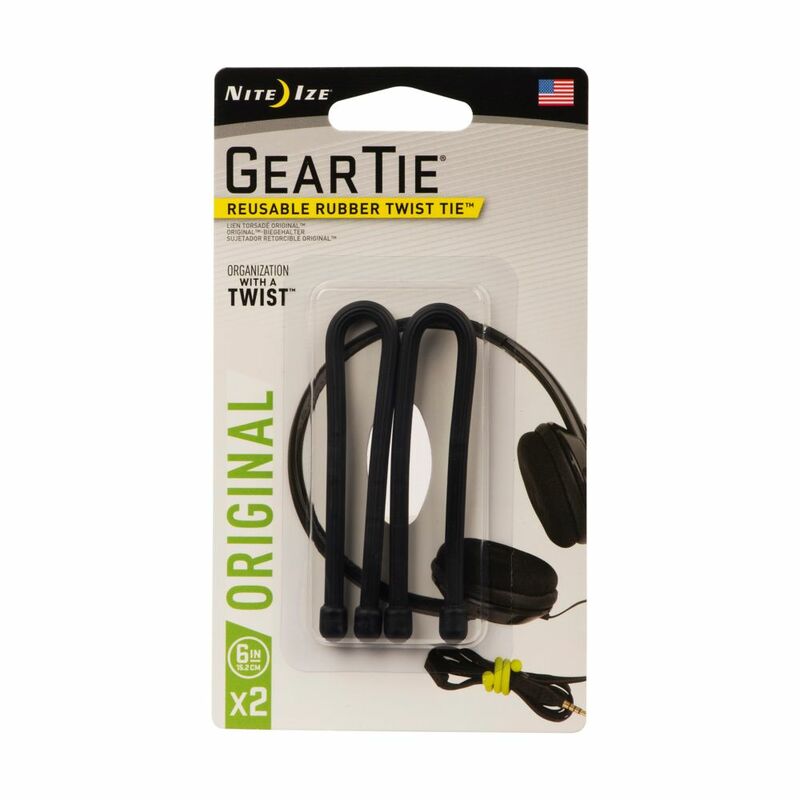 2-Pack Black Made of bendable wire interior with a durable, soft rubber exterior, the 6" Gear Tie is the perfect solution for containing and organizing medium to long cords and cables, hair dryers, kitchen appliances, and all those other electronic items you need every day. Reusable, water-proof, available in 2 packs. Gear Tie 6 Inch. 2-Pack Black is rated 4.9 out of 5 by 15.